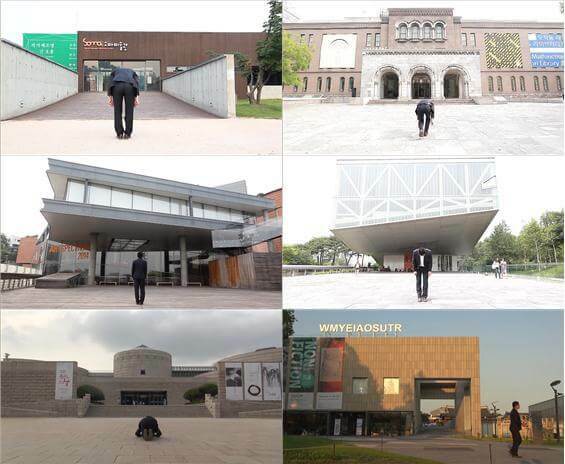 In this video, I walk away from the art museum’s entrance and I bow to the museum building twice, as I am participating in a Korean funeral ceremony. This gesture is performed to pay my respects to the art institution to which I belong as an artist, and at the same time, to say good-bye to its authority. After bowing, I walk to the opposite side of the museum, disappearing from of the frame, so the audience can no longer see me. In this context, the frontal shot of the enormous size of the art museum’s gate symbolizes its institutional authority. The video reveals the triangular relationship between the artist (as mourner), the art institution, and the audience (as witness).